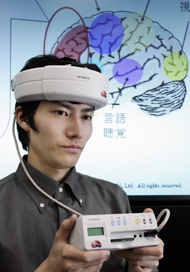 Japanese electronics giant Hitachi has unveiled a prototype model of a portable brain-machine interface lately. This portable brain-machine interface is equipped with eight pairs of lasers and optical sensors in a special headband (weighting 400gram to 630gram) to measure prefrontal cortex activity. It senses activity from the user’s brain and converts it into signals to control electronic devices. It’s pretty cool! In fact Hitachi demonstrated an early prototype in November last year. The device enabled users to turn on/off the power switch with a thought. It was very unique but the design of the headset was a bit old-fashioned. This latest brain-machine interface selling at US$840,000 which is shown at Hitachi’s headquarters in Tokyo represents an enormous leap forward compared to the previous version. Hitachi says the system is easy to use and that it has been built using parts from models designed for medical applications. You only have to wish ‘I dream of Jeannie’ style and electronic devices around you will turn on/off automatically. Wonder when we’ll be able to read and control other people’s minds with a headset.